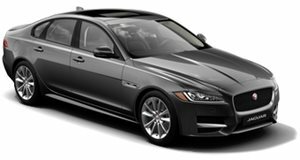 Optional Speed Pack for the XFR includes suspension and aerodynamic enhancements, raising top speed to 174 mph while improving efficiency. If a 510-horsepower supercharged V8 Jaguar isn&apos;t enough for you, the British automaker has announced something a little more enticing in Moscow. Acting as something of a stop-gap until the more powerful XFR-S comes along, the Speed Pack for the XFR raises the car&apos;s speed limiter from 155 mph to 174. With a recalibrated engine and eight-speed automatic gearbox, efficiency has increased by 11% and emissions down by 8%. A revised aero pack and suspension are also part of the package. It won’t be Jaguar’s best seller, but that hasn’t stopped the Jaguar XF being one of the best cars ever made by the British car maker.